Halloween is a holiday when imagination runs wild. Whether you are going to a party or a parade, this is the holiday to join the masquerade. The possibilities are endless – you can present yourself as a superhero or a world leader, a puppy or a princess, a vampire or a bunny rabbit.Halloween treats are everywhere, free when you call out “Trick or Treat” at the home of a friendly neighbor.Thoughts of Halloween disguises and Halloween treats got me to wondering. Could I disguise an often overlooked and sometimes disparaged vegetable, rich in vitamins and minerals and low in calories, in a Halloween treat? I was thinking about parsnips. To be honest, I have never been a parsnip fan; I’ve cooked them, served them and composted them, generally in that order. My past attempts have been dry, woody, insipid or simply uninspiring. I began by preheating the oven to 350 F/175 C and placing foil liners in 18 muffin cups. I used the largest holes on a box grater to grate two large parsnips to make 2 cups/180 g and one large apple to make 1 cup/100 g. I whisked together 2 cups/200 g of flour, 3/4 cup/100 g of sugar, three-quarters of a teaspoon of baking soda, one and a half teaspoons of baking powder, half a teaspoon of salt, one teaspoon of dry ginger, and half a teaspoon ground nutmeg in a mixing bowl. I whisked together two eggs, 3/4 cup/180 ml of oil, 1/2 cup/120 ml of milk and a teaspoon of vanilla in a separate bowl. I combined the egg mixture and the flour mixture, added 1 cup/100 g of chopped almonds, 1/2 cup/100 g of chopped dried peaches, the parsnip and apple. The batter was divided among the muffin cups and baked for 25 minutes, until a toothpick inserted in the center of a muffin came out clean. Removed from the pan, the muffins cooled on a wire rack. 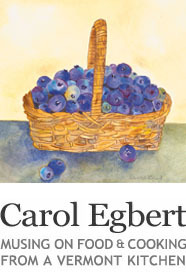 With a basket of muffins in hand and a paper asking, “What’s disguised in these muffins?” I set off for a gathering or friends who were putting the church garden to bed for the winter.Fifteen friends sampled the muffins. Their guesses included: coconut, orange, banana, carrots, lemon zest, zucchini, guava, cauliflower, pistachio and my favorite – ground-up donuts. No one guessed parsnips – a perfect disguise! Perhaps this is the beginning of a new Halloween tradition – Masquerading Vegetables on Parade. With newfound respect for parsnips I’m looking for other ways to use them. Any thoughts? Say Boo! 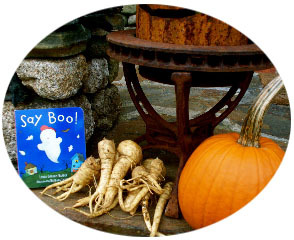 A perfect Halloween book, written by my friend Lynda Graham-Barber, along with the parsnips from her garden were the inspiration for is post. Lynda lives in the Northeast Kingdom where she writes, gardens and cooks. What a great idea! I would never have thought to use parsnips in muffins, but I can see they would be good. They would add a lot of moisture. I do enjoy parsnips and I espeically love your illustration. Your paintings always make me happy!! Thanks – your comment makes me happy! Thanks for dropping by my blog. As for your parsnips, my fav is roasting them with a little honey, and remember to cut out that woody centre it is not nice. What a unique, creative idea! I bet parsnips would work in your squash muffin recipe. Thanks for stopping by. I LOVED this post. Parsnips were my Dad’s favorite vegetables and he grew them every year and was the only one in the family who actually enjoyed them! But then I don’t remember any inspired muffins…. Just wondering–is it possible that you mean 2 cups of grated parsnips? Thank you….Yes, I meant two cups and have changed it. You get the prize for careful recipe reading.